Enter the deceptively charming world of Small Town USA, where whisky is hidden behind the potted plants, and heroin is hidden in a messy room. American poet, Jackie Simmons has lived a suburban life in Connecticut, USA; she has seen many of the things that most of us want kept firmly under the family carpet or securely locked in gran’pa’s woodshed. This collection is not for the fainthearted but nevertheless should be read by everybody before, not after, they run off the rails. This book demands that you sit up and take notice because this could well be you, your children, your neighbour or the sweet family that lives up the road at number 32. 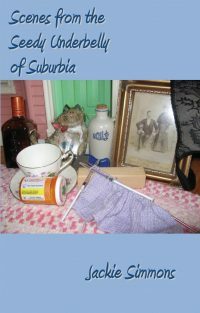 Scenes from the Seedy Underbelly of Suburbia is a book of sweet ascerbic poems, maybe shocking, but then most of us are past shocking, which remind us that the route to the picket fence, American dreams always seem to feature that white picket fence, or the privet hedge, passes many interesting side routes complete with rusting cars, peeling paint, and a toxic chemical plant. Share Jackie’s journey from New York City to Fairfield Connecticut and take a look down one of those cute picturesque byways.